Photograph courtesy Tony Sayer A close-up of 25267 at Nottingham on July 31st 1976. This view illustrates well the tablet catcher recess which was fitted to those members of the batch delivered new to Eastfield. In later years many of this batch would have the recess sheeted over during Works visits. Fitted with tablet catcher recesses (never removed). The fifteen year career of D7617/25267 started out on the Scottish Region before transitioning to the London Midland Region. August 1968 to Preston Division (D10). 25267 was the 94th Class 25 withdrawn, one of twelve retired during February 1981. 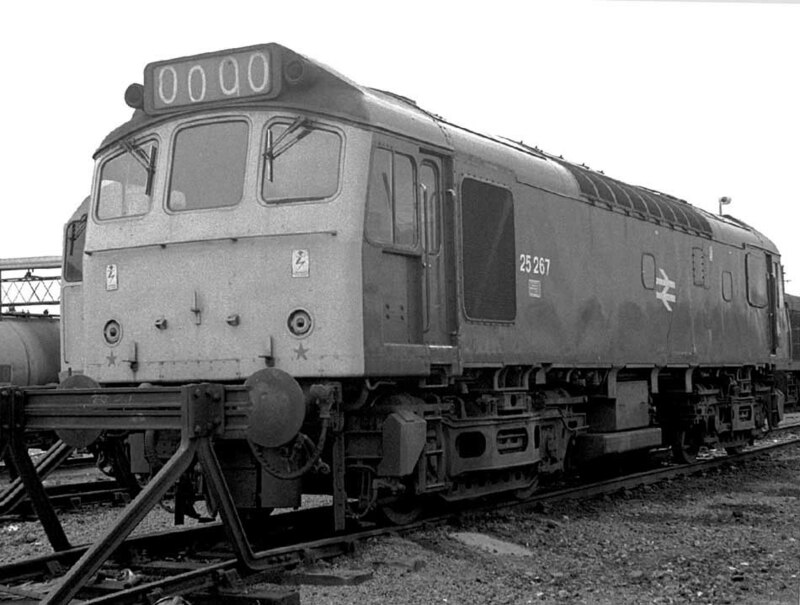 After withdrawal 25267 was stored at Leicester from April to July 1981. 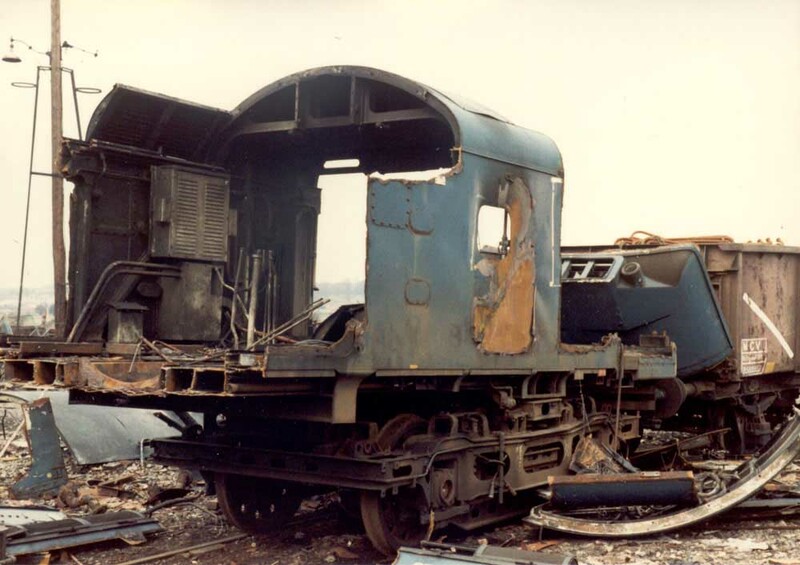 25267 was then moved to Derby Works and remained here until broken up by the middle of February 1982. Photograph courtesy Jerry Glover Little remains of 25267 at Derby Works on February 6th 1982 as the locomotive draws closer to being no more than a jumble of scrap metal bits and pieces, much of it scattered on the ground. The exposed cross-section of the locomotive body reveals something of its construction. Noted Crewe Works November 1974 - January 1975. Due a Classified approx June 1980?? Although the Scottish Region had received a batch of brand new Class 24s for use on duties from Inverness depot, the Region had not, so far received any new Class 25s. 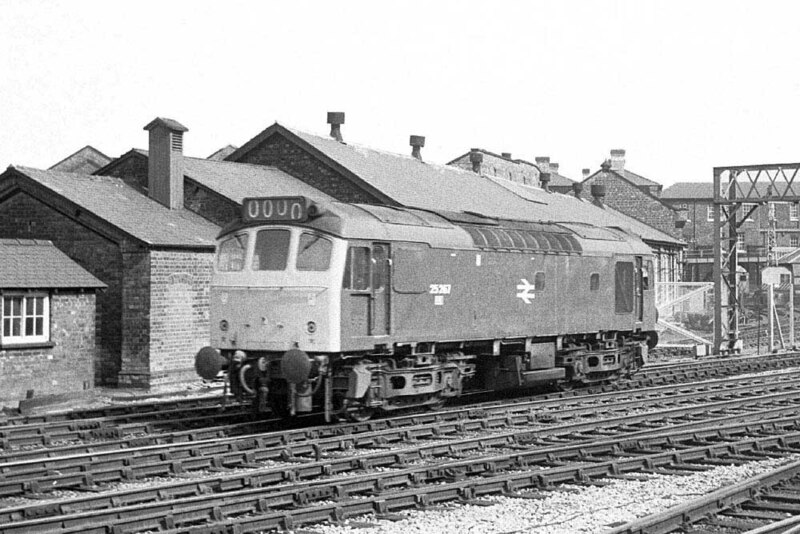 However between April & September thirteen Class 25s were delivered from Derby Works to Eastfield (65A), this included D7617. These were the only Class 25s delivered with a cabside recess to accommodate tablet catcher equipment. Although based at Eastfield these Type 2s spent much of their time in South West Scotland alongside the BRCW Type 2s quickly sending many Ayr & Hurlford’s Crabs, Black Fives & BR Standards to the storage lines and additionally helped Dumfries lose its steam allocation effective April 30th. At the end of May Ayr placed seven steam locomotives into storage because of the Type 2s arrival. Additionally at this time, with the arrival of these Type 2s, the return of some re-engined NBL Type 2s to service and the tranfer of more Claytons to Haymarket, the ScR were able to put the first of the Class 26s through Works for the fitting of slow speed control equipment & dual braking for use on MGR workings. After two years alloocated to the Scottish Region D7617 was transferred to the Preston Division during August. One of the earliest recorded passenger workings took place on August 9th with 7617 & 7618 working the 07.35 Nottingham - Llandudno Town and the 13.52 Llandudno Town - Nottingham return. On October 31st 7617 was noted working the 15.55 Exeter St Davids - Barnstaple and the 17.55 return. The 'drummer' freight working in the Penistone area was worked by 7617 on November 17th. On July 13th 25267 & 25088 worked a roundtrip Leicester - Skegness service. During January 25267 was outshopped from Crewe Works, the tablet catcher recesses were still in place. On May 6th 25267 was noted at Kings Lynn with 24091 to work a special freight to Bristol. On May 11th 24053 was used to start the journey of LMS 4-6-2 6203 Princess Margaret Rose from Butlins Holiday Camp, Pwllheli to Derby Works for some much needed attention. 24053 would work the train to Crewe, here 25267 took over for the run to Derby. Total journey time was sixteen hours, on the Cambrian lines the speed limit was 15 mph except for 5 mph at Old Chaple Viaduct, Barmouth Tunnel & Viaduct and Aberdovey tunnels. From Shrewsbury to Derby the speed limit was 25 mph with the exception of 5 mph through Meir tunnel on the Stoke - Derby section. On July 16th the 14.25 Birmingham – Paddington was taken over by 25267 & 25269 following the failure of the rostered locomotive. These machines then returned with the 17.40 to Birmingham, not the normal way the diagram worked but necessary due to the lack of crews at Paddington familiar with the Class 25’s. The 08.00 Walsall - Yarmouth to Norwich and the return 14.15 Yarmouth - Derby from Norwich were worked by 25267 & 25302 on July 26th. On September 10th 25267 & 25327 were let loose on the Midland mainline to work the 14.30 St. Pancras - Derby. 25267 was noted at Tyne Yard on January 22nd. 25243 & 25267 were noted on an engineers train near Chippenham on January 25th. The lengthy train included track panels with supporting cranes, spoil wagions, staff vehicles, brake vans and PWM653. The 07.10 (?) Derby - Matlock and the 08.00 Matlock - Derby were worked by 25267 on August 16th. Photograph courtesy Tony Sayer Derby station on July 28th 1976. 25267 drops down past the station, no doubt on the way to the fuelling point. The high positioning of the number indicates, at this time, a repaint at Crewe Works. The latter half of the summer of 1979 saw 25267 with some weekend passenger workings. On August 5th 25267 was noted on the evening Nottingham - Crewe parcels. The next day (6th) the 08.52 Leicester - Skegness was forward from Nottingham by 25267 & 25090 (having replaced 25051 and 25053). The return working was similarly split with the 12.35 Skegness - Leicester worked to Nottingham by 25267 & 25090, at Nottingham 25051 and 25053 took over. The next weekend (13th) the 09.20 Derby - Skegness and the return 13.05 Skegness - Derby were worked by 25267 & 25135. On September 3rd the 08.00 Walsall - Yarmouth to Norwich and the return 14.15 Yarmouth - Walsall from Norwich were worked by 25267 & 25320. On May 29th the 15.15 Plymouth - Manchester Piccadilly was wotrked between Gloucester & Birmingham New Street by 25267 & 25142. Nine years allocated to Toton allowed 25267 to work many of the East Midlands area summer holiday services, both timetabled and extras. One of its longest recorded passenger workings (of 234 miles), was a round trip day excursion Hinckley - Skegness with 25142 on June 24th. The 11.15 Gloucester - Swindon parcels saw much variety including 25267 in early November, this locomotive would go forward on the 15.40 Swindon - Bescot freight. A wintry February 14th 1979 finds 25267 heading north out of Derby about to cross the Nottingham Road overbridge. Also noted passing by during a 45 minute wintry spell whilst lineside were 31115, 31222, 46034 & 47164. On June 23rd 25267 & 25302 worked the 08.00 Walsall - Yarmouth to Norwich returning with the 14.15 Yarmouth - Derby from Norwich. The next day (24th) the same pair worked a roundtrip Leicester - Skegness diagram. The second week of July proved particularly busy for 25267 & 25264 working a roundtrip Leicester - Skegness diagram on July 8th, 9th, 10th, 11th, & 12th, a total of 1,020 passenger miles. After a day off on July 13th the same pair worked the 14th's 09.34 Leicester - Paignton relief (234 miles). The month-end followed with trips over the Marches routes, on July 28th working the 19.28 Crewe - Cardiff and the 30th's 17.10 Cardiff - Crewe. On August 1st 25267 worked the 06.32 Peterborough - Kings Cross and the 17.18 Kings Cross - Peterborough, whilst on August 2nd it worked at least the 07.00 Peterborough - Kings Cross. The 08.32 Derby - Yarmouth to Norwich and the return 14.15 Yarmouth - Derby from Norwich were worked by 25267 & 25243 on September 8th. 1980 would be the last full year of service for 25267, however this did not slow down its use on passenger workings. The last week of May found 25267 on Cambrian metals. On May 24th 25267 & 25122 worked the 04.10 Shrewsbury - Aberystwyth and the 10.07 Aberystwyth - Euston to Wolverhampton. The next day (25th) produced the 08.45 Birmingham New Street - Aberystwyth and the 18.10 Aberystwyth - Euston to Wolverhampton. The following weekend, on May 31st 25267 & 25260 handled the same diagram as worked on May 24th. After a break foe passenger workings during June, on July 5th 25267 & 25270 worked the Walsall - Norwich - Yarmouth - Norwich - Derby diagram (370 miles). It was back to the Western Region on August 9th with 25267 & 25261 working the 12.23 Manchester Piccadilly - Paignton forward from Birmingham New Street. Two weeks later on August 23rd 25267 & 25203 worked the 08.02 Walsall - Yarmouth to Norwich and the 14.15 Yarmouth - Derby from Norwich. 25267's last passenger working involved the 17.00 Nottingham - St Pancras on September 1st, working forward from Leicester after 45111 had failed and been removed. 25267 was withdrawn on February 1st 1981. The view above of 25267 in the snow close by the Derby Evening Telegraph building and the Trent Bus garage at Derby was taken at lunch time on Wednesday February 14th 1979. At the time I was working in St Peter's Street, using my push bike to get to and from work. Whilst working at this location I realised that on my bike it was but a few minutes to get to the station and back during my lunch hour! So from time to time when the weather was good I'd visit the station for about 45 minutes during my lunch hour. 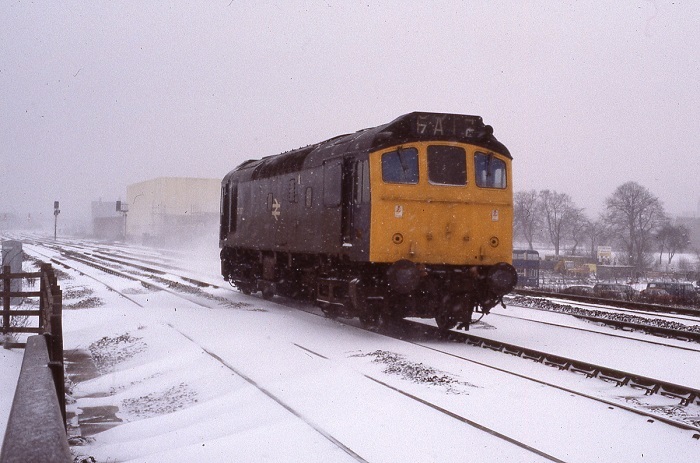 When snowy weather arrived in the middle of February 1979, the lunchtime of February 14th provided the best opportunity to see what was running in the snow, but instead of visiting the station I headed to the footbridge alongside the line where it crossed over Nottingham Road. The weather was grim and cold, snow was in the air and the bad weather over much of the country had disrupted many of the rail services - trains were running but not exactly to the timetable. Six trains or light engines were observed in about 45 minutes, including this atmospheric view of 25267 heading north. Job postings took me away from St Peter's Street and the lunchtime memories of these brief visits faded into obscurity until a couple of decades later when I was informed that a nephew had died unexpectedly. I met Steven from time to time on my return visits to the UK, mostly by chance when meeting the family relatives on whirlwind visits. Steven's life had had its ups and downs, at the time of his death his circumstances were far from perfect. Suffice to say that as further inquiries revealed, one afternoon about 4pm Steven had been hit by a northbound Virgin HST whilst walking from the town center to his mother's home. When the emergency services arrived lineside those first on scene to provide assistance recognised Steven from previous calls. Through further research into this tragedy it appears that the location captured in the snowy scene of 25267 many years earlier was the site where Steven was killed. What had been a fond memory of a specific event in time was now tinged by awareness of a tragedy that would have been incomprehensible to imagine or understand at the time of the photograph being taken. Page added March 23rd 2012. Last updated April 21st 2019.